Over the years, MINI has proven that there really is a MINI for all walks of life and all budgets. Never was that made clearer than when the MINI Countryman first appeared nearly a decade ago. Since then, the Countryman has been facelifted and updated to keep it relevant, attractive and as MINI as ever. 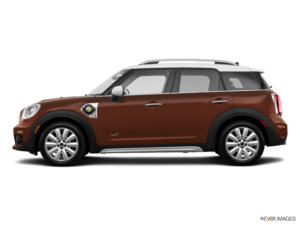 For the 2018 model year, the MINI Countryman retains that fun-to-drive nature, along with the practicality of a compact SUV. Currently in its second generation, the Countryman sports that unique MINI front grille, just made slightly larger due to the vehicles larger dimensions over the hatchback version. Since it’s redesign last year, the MINI Countryman sports a much sleeker look, along with the latest in MINI DNA with updated taillights and front grille. Inside, everything is decidedly MINI with the circular ring remaining in the centre stack where you’ll find the entertainment screen, while the gauge cluster features the speedometer and other vehicle info. The steering wheel feautres audio and cruise control buttons, as well as paddle shifters for more enthusiastic driving. The base Cooper ALL4 features a 3-cylinder TwinPower turbocharged engine that produces 134 horsepower and 162 lb-ft of torque. While the Cooper S ALL4 boasts a 4-cylinder TwinPower turbocharged mill that pushes out 189 horsepower and 207 lb-ft of torque. There are two other rather unique MINI Countryman models available: the John Cooper Works ALL4 and the Cooper S E ALL4. These two are kind of on opposite ends of the performance spectrum, with the JCW ALL4 featuring a tweaked version of the 4-cylinder mill to produce 228 horsepower and 258 lb-ft of torque, and the MINI E offering up a hybrid plug-in engine that means you can drive on battery power alone for approximately 20km at lower speeds. 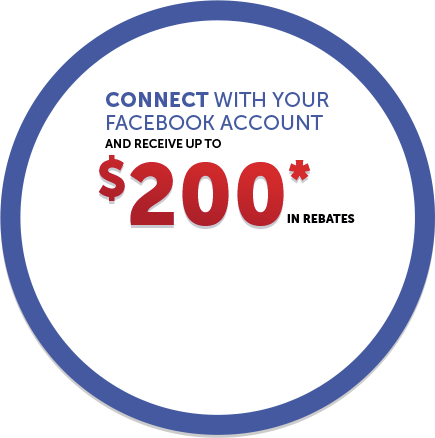 All models are equipped with MINI’s ALL4 all-wheel drive system. 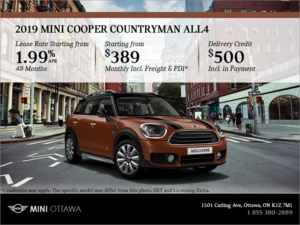 To find out more about the 2018 MINI Countryman, head down to your local MINI Ottawa dealer today to speak to one of our experts about everything the Countryman has to offer. And don’t forget to book a test drive, because being behind the wheel is the best place to be in a MINI.